Celtic were the main winners in this weekend's Scottish Premiership thanks to a late victory at Dens Park extending their lead at the top of the table to 10 points. However, there was plenty talent on show throughout the games that survived the wintry weather as Scottish football heads into an international break. Can Hibs be caught in gallop for top six? Formation 4-2-3-1: Bachmann (Kilmarnock); McGowan (Hamilton Academical), Halkett (Livingston), Findlay (Kilmarnock), Tierney (Celtic); Dicker (Kilmarnock), Omeonga (Hibernian), McLennan (Aberdeen), Sibbald (Livingston), Horgan (Hibernian); McNulty (Hibernian). The man filling the goal for Kimarnock makes difficult saves look very comfortable and the on-loan Watford man has become a big player for manager Steve Clarke. He has real presence and turned in another impressive display in Saturday's 1-1 draw with Rangers at Ibrox. Full-back Aaron McGowan's first goal for Hamilton, the only one against Hearts on Saturday, was a thing of beauty and could go a long way towards securing Premiership survival for Accies. He was also part of a much-improved defensive set-up that frustrated Hearts. I picked Livingston skipper Craig Halkett in last weekend's selection and he keeps his place after playing a key role in the 1-1 weekend draw with Aberdeen at Pittodrie. The queue of clubs wanting to sign the centre-half at the end of the season continues to grow. It's same again in central defence for me, with Kilmarnock's Stuart Findlay delivering another top performance at Ibrox. Scotland manager Alex McLeish clearly agrees, adding Findlay to his squad for the first two Euro 2020 qualifiers. Kieran Tierney may well play at left-back for Scotland in Kazakhstan with national team captain Andy Robertson potentially out due to a dental problem. No Celtic player showed more determination than Tierney on Sunday as the champions-in-waiting dug out a late winner in Dundee and took another stride towards another title. I've been able to include quite a few young Scots in my line-up over the last couple of months and Connor McLennan is the latest. The 19-year-old winger scored one of the goals that took Aberdeen to the Scottish Cup semi finals and, even amid the disappointment of dropped points against Livingston at the weekend, McLennan stood out. Most weekends it's difficult to separate Gary Dicker and Alan Power because the midfield pair rarely fail to deliver in the Kilmarnock engine room. Skipper Dicker gets the nod this time for a towering performance at Ibrox on Saturday that kept Killie in the hunt for European qualification. Stephane Omeonga has cemented a place for himself in the Hibs midfield at just the right time to earn a call-up to the Belgium Under-21 squad. On loan from Genoa, Omeonga was an eye-catcher in Saturday's emphatic 2-0 home win over Motherwell. Former Falkirk midfielder Craig Sibbald had an injury-interrupted start at Livingston and it's only now he's starting to show his real talent. He followed up his goal in the home win over St Johnstone with the equaliser at Pittodrie on Saturday and had a big influence in the game. 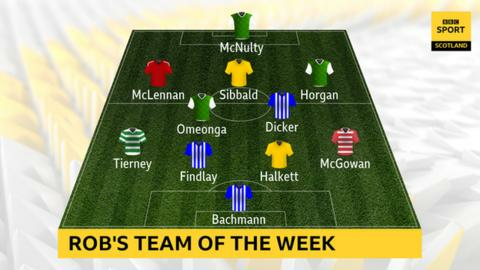 Daryl Horgan is no stranger to my team of the weekend and he was again a prominent performer for Hibs in Saturday's defeat of Motherwell, a result that has gone a long way to securing a top-six finish. The wee Irishman should have scored, but he was dynamic in just about everything else he did. Up front for Hibs, Marc McNulty is high on confidence at the moment and hardly put a foot wrong on Saturday against Motherwell. On the back of his Scotland call-up, the on-loan Reading forward's penalty conversion was his seventh goal in as many games and he has played a big part in the recent revival at Easter Road.